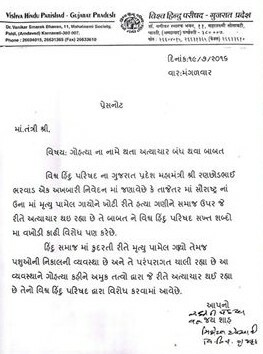 Issued by the VHP's Gujarat unit general secretary Ranchhodbhai Bharwad on July 19, the statement has been made in order to “condemn” the Una incident, in which four Dalit youths were tied to an SUV and beaten up with iron rods for seeking to skin a dead cow. Addressing the VHP leader's statement, he insists, “Whatever you do, you will now have to take care of the last rites of the mother cow”, referring to the Dalits' massive protest by refusing to dispose of carcasses of cow as part of the protest against the July 11 Una incident. The VHP statement comes, ostensibly, ignoring huge amount of literature already available on how disposing of cow and other animals is part of the caste occupation of a section of Dalits by heredity associated with the job of tannery. Another Dalit, Bijoy Sindhur, says he “survives” on the disposal work. "I have been doing this utava kaam - lifting of carcasses - since I was a child helping my parents. And on my own for nearly 10 years. The last cow I lifted was a few weeks ago." 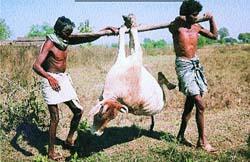 Dr Ambedkar further says, “Carrying the dead cow had become an obligation though originally it was a privilege. As they could not escape carrying the dead cow they did not mind using the flesh as food in the manner in which they were doing previously".